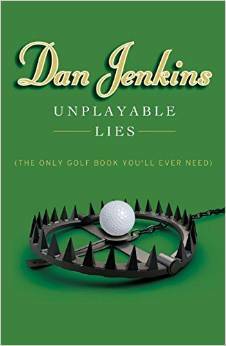 The fans of the finest golf writer of the last half century, Dan Jenkins, will be pleased to know they can add a new publication, “Unplayable Lies (The Only Golf Book You’ll Ever Need)” to the Dano section of their golf library. This is a compilation of 41 essays on our sport-about half of them new writings and the rest adaptions of articles previously published in Golf Digest. Typically such “collections” are scrap books of dated writings with a nostalgic value to the regular readers. But Jenkins is anything but typical. He adds a ream of new fodder for diehards to consume covering topical subjects like “Is Your Country Club Old or New Money”, “Titanic and I”, “Junior Golf”, and “Talking Heads” with his typical combination of wit and insight. It will have you chortling in your man cave reading chair. In the forward his daughter Sally Jenkins, a talented and accomplished writer and author herself, captures his gift succinctly. “I reread the old work and look at the new, and what I see is a constant stripping away of pretense, and of the profligate excesses of feeling that surrounds golf….to find the truth underneath”. Old Money will always have money. Three members of New Money are in the process of asking the Federal Reserve for a free drop from an unplayable lie. Ian Baker-Finch was a surprise winner of the 1991 British Open at Royal Birkdale, then disappeared. When he attempted a comeback at Troon in ’97 he appeared to be a bit wild off the tee. His round consisted of 92 strokes, 4 dead, 55 injured, and 67 missing. The Socialist Paradise Invitational in Buenos Aires. The field must be limited to fifty pros who have never won a tournament of any kind and hate the capitalist societies into which they were born. All fifty will be declared winners and given equal prize money and identical trophies. The Immigration (a team event). A team would consist of a name pro, an illegal alien, a border guard, and a member of the U.S. Senate. First prize for the winning team would be Yuma, Arizona. Second prize, Nogales. His description of the PGA Merchandise show is priceless. It includes Putter Man’s booth. The proprietor, who could have passed as a Texas Ranger, has retrofitted classic putters into fire arms. “When the flash mobs come over the fence and onto the fairway to get your goods, you can take out the first wave by yourself”. The Bullseye is “loaded with nine-millimeter Gold Sabre 147 grain jacket hollow points. You can get thirteen hundred feet a second at the muzzle”. Jenkin’s parody of the network vanilla Talking Heads describing the golf action will bring tears, of laughter, to your eyes. It is Jim Nance and his politically correct Pollyannaisms leaping off the page at you. 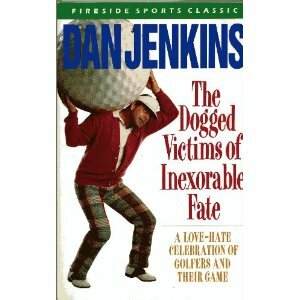 Let us not forget that Dan Jenkins has covered more majors than the average fan’s age in dog years so this collection is lush with wonderful anecdotes and enlightening personal statistical compilations of the accomplishments of guys from Bobby Jones to Ben Hogan to Tommy Bolt To Jack and Tiger and about 50 others in between. To the delight of his readers, Dan Jenkins, at the tender age of 85, is still pumping out the finest combination of golf satire and fact, often in the same sentence. This one is a must read for cynical golf addicts everywhere. It is easy to have a Dan Jenkins section in your personal library since he has been a prolific sports/golf writer for over a half a century. He has put out countless entertaining books-both fiction and non-fiction-written in his Texas wise-guy cynical and satirical style. The writing is always observant, to the point, and almost merciless in a kind of arms length critical view. This particular collection of sixteen short pieces was published in 1970 and it covers the full range of golf matters of the time. Unlike today where the writers have to beg for interviews, Dan Jenkins lived with the protagonists week-to-week-traveling, playing cards, drinking beers, and sharing stories. As a result, there was a level of trust and confidence developed between them that offered a clear window into the hearts and minds of the players of the day. In reading this you feel you are getting an insider’s perspective on the development of the game in a golden era. “On the golf course, a man may be the dogged victim of inexorable fate, be struck down by an appalling stroke of tragedy, become the hero of unbelievable melodrama, or the clown in a sidesplitting comedy-any of these within a few hours, and all without having to bury a corpse or repair a tangled personality”. Jenkin’s writings bears out how human drama defines the game as guys try to excel at an individual sport that will expose every weakness in technique or resolve in a remorseless competition. I have recently re-read this book and I found that the subject matter he writes about seems timeless-municipal golf, slow play, head cases, television, majors, the greatest to ever play the game. The issues today are the same as they were in the 1960’s, the names have just changed to protect the innocent. There is a wonderful chapter about a regular on the tour who you barely know about-George Low. He was a journeyman pro in the 30’s and 40’s who realized with the proper balance of schmoozing and familiarity he could make a life for himself without lifting a club. As Jenkins says, “He was America’s guest, underground comedian, consultant…….a man who conquered the two hardest things in life-how to putt better than anyone ever and how to live lavishly without an income”. He was a fixture on the veranda at every tour stop, tour watering hole, and putting green. His prowess with the flatstick and a quick joke made him welcome fixture on the tour for thirty years. In the chapter called “Wide Open” he describes a tournament with venues of aristocratic reverence, offering a title which guarantees wealth and fame for life, but that could be won by just about anybody or a nobody. For example, Lee Trevino, “a laughing tub of echiladas in bright red socks with a caddy-hustler’s game” or Orville Moody, “who had a name like … a drag strip mechanic and who didn’t even have a hometown to be poor from. Just fourteen years of Fort Hoods and Koreas”. My personal favorite is his piece on Dave Marr “The Pro of 52nd Street”. Dave Marr was Texas born and bread-pure Banlon in Argyle socks. In an otherwise undistinguished journeyman’s career he won a major, the PGA at Laurel Valley, and parlayed it into a life- long corporate outing full of networking with the stars and the champions of industry. You see this charming, likeable, self-deprecating guy realized what Frank Sinatra knew, if you can play NYC you can play anywhere. So he moved to New York, traded the argyle socks for double breasted blazers and Gucci belts, and adopted the New York lifestyle as his own. Doing his thing in the bistros and bars he developed life long friendships with celebrities that made him someone to hang with. In spite of regularly finishing twenty-third or worse, the income flowed from endless corporate outings and a broadcast gig based on his popularity among his peers and an insider knowledge of the game. The book ends with “The Doggedest Victim” about his good buddy Arnold Palmer. Jenkin’s personal account of Palmer’s historic and folkloric come from behind victory at Cherrry Hills in the 1960 U.S. Open characterizes the entire book. In Palmer’s ascent to “the most immeasurable of all golf champions” Jenkin’s characterizes him as the “doggedest victim of us all”. Dan Jenkins will be inducted into the Golf Hall of Fame in May of 2012, only the fifth golf writer to be so honored and the first to be inducted while he was living. As one of the most prolific golf writers in history, his body of work clearly qualifies him for this long overdue honorarium. Do yourself a favor, the next time you are on the Barnes and Noble web site and need another $10 item to get you over the $25 minimum for Free Shipping buy yourself a copy of “The Dogged Victims of Inexorable Fate”. It will be a welcome addition on your nightstand or next to your thrown and provide you plenty of laughs and expand your knowledge of the history of the game. Those of us who have read Sports Illustrated most of our adult lives had a habit of picking up the current issue and immediately turning to the back page to read Rick Reilly’s column. Rick had a way of turning a phrase on the pressing sports issues of the day like no one in the business. Cynical, funny, insightful and always entertaining. 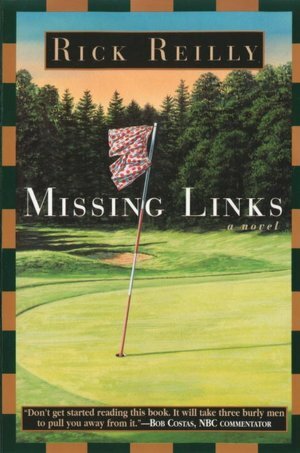 In his book, Missing Links, Reilly spins a hilarious tale of a bunch of middle-class slackers in Boston who “wasted their youth” playing and gambling every day at “possibly the worst golf course in America”, a place he called Ponkaquoque Municipal Course and Deli. The food was bad, but the golf course was worse. “It was one of the great mysteries of life why grown men would actually arrive at 4 a.m. to put their little golf balls in a rusty old pipe…and then go back and sleep in their cars, just to play a golf course at eight that would have a hard time making Best of Chernobyl”. Two-Down- Never lost-as he said “Bets don’t start until I’m two down”. Dannie- Old female chop, baseball hat, baggie sweaters but “a cotton eyed Arkansas accent…with a twelve-car-pileup body and a little nose that could’ve hardly made a dent in a cream pie”. They bet on anything and made up the games as they went along. “Reversals” in which your opponent could tee up your ball, turn around, and hit it as far in the opposite direction as he could. “Alohas” where you double everything on 18. “Murphys” where once every 9 holes your opponent could pick up your ball and place it anywhere within two club lengths of where it lays. “It is very discouraging , indeed, to be just about to hit the bejesus out of your drive and than have somebody holler, “Murphy” and walk over and deposit your ball in a ball washer”. Now Ponky sat adjacent to The Mayflower Club which was “only the finest, snootiest, private, white, sperm-dollar country club on the eastern seaboard”. It was full of blue blood members with numerals in their names who drove Bentleys and Jaguars into “a kind of green-and-blue Protestant Paradise”. Which gets us to “The Bet”. You see The Bet is what really changed it all at Ponky turned the place upside-down and shook out all of the loose change. It came about when three of the Chops-Two-Down, Dannie, and Stick- decided the ultimate challenge would be to see who could be first person to finagle their way into play the Mayflower Club. $1,000 a man, winner take all. Clearly this was to be a no-holds barred, anything goes competition and what unfolds is a series of tales of intrigue and woe as the three of them seek to capture the ultimate Ponky Prize. Once you start reading this book you won’t be able to put it down, except to catch your breath between sessions of uncontrollable laughter. It is Rick Reilly at his best…..frat house humor…..pure entertainment.